The Green Book (Ontario Occupational Health and Safety Act and Regulations), is updated annually and published by OSG Inc. based on legislative and regulatory changes. 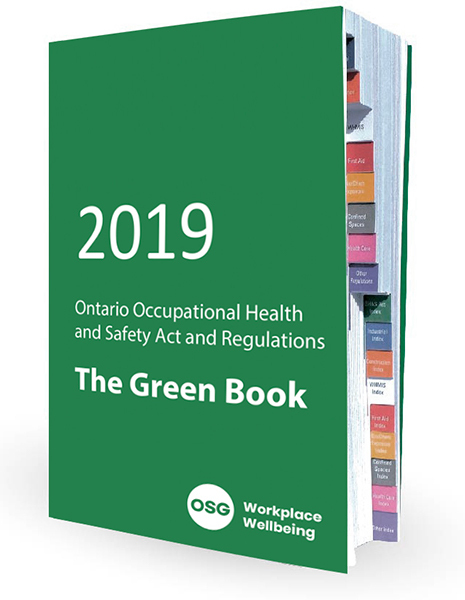 Our 2019 Green Book contains the complete, current Ontario Occupational Health and Safety Act (OHSA) and also includes the following regulations: confined spaces, construction projects, control of exposure to biological or chemical agents, designated substances, farming operations, first aid requirements, healthcare and residential facilities, industrial establishments, and WHMIS. *Note: This book does not include information pertaining to mines. *Participant manuals can only be purchased by trainers who hold a valid OSG certificate in Train-the-Trainer.